Warner Bros.’ Edge of Tomorrow has been released early to digital format about four weeks before the film is available on Blu-ray Disc, DVD, and On Demand to rent. 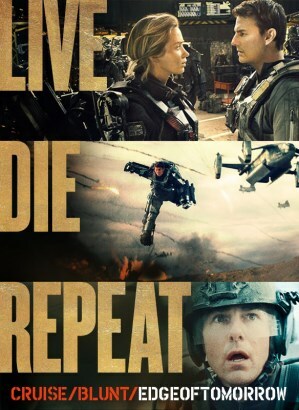 You might take notice the movie has gone through of bit of branding evolution — now referred to as Live Die Repeat: Edge of Tomorrow rather than the shorter, theatrical title Edge of Tomorrow. (See the new poster art down below.) The 113-minute film was directed by Doug Liman (The Bourne Identity) and stars Tom Cruise and Emily Blunt. The average price of Live Die Repeat: Edge of Tomorrow from online digital distributors is $19.99 for HD quality, and about $15.99 for the SD version. Apple iTunes, Cinema Now, Target Ticket, and Vudu are offering bonus material with the purchase of the digital movie, such as deleted scenes and production featurettes. See individual distributors for more details. What’s worth noting is Best Buy’s Cinema Now has dropped their prices slightly. Whereas the service typically charges $22 for a new release in HD, Live Die Repeat: Edge of Tomorrow is selling for $20.99 (or $15.99 SD). Interestingly enough Vudu is selling a 3D version (only for 3D-enabled TVs) for $31.99, as well as the HD or HDX version for the usual $19.99. For those of you building up your UltraViolet collection, UV-supporting digital services include Target, Walmart’s Vudu, and Best Buy’s Cinema Now. Once you link your accounts from Cinema Now, Target and Vudu, your library will contain all titles purchased within the UltraViolet database. As we do with many blockbuster films that release early to Digital HD, here’s a price comparison between digital video services. *At time of article publication.